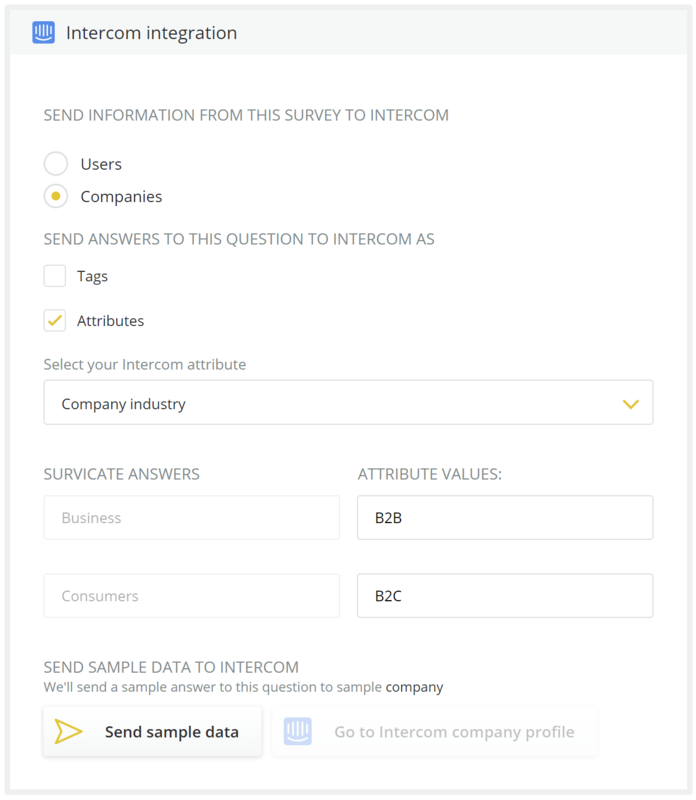 How to send survey responses to Intercom user profiles. 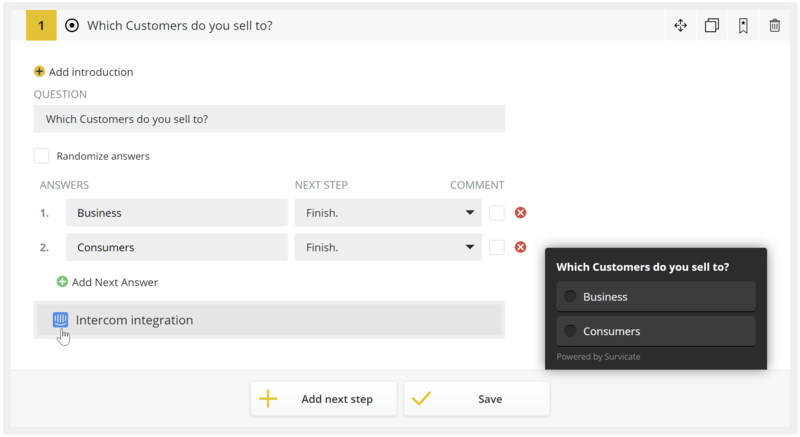 This article focuses on setting up how you want to have your responses sent to Intercom user profiles. 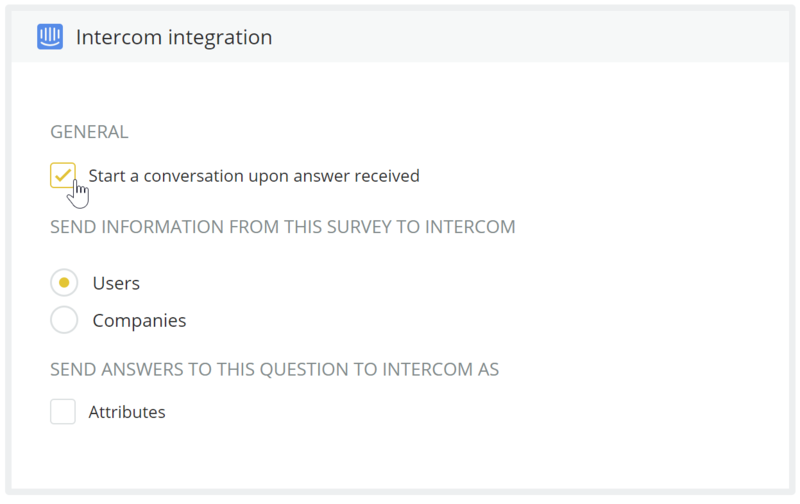 If you want to find out how to integrate Survicate and Intercom first, please check out this article. 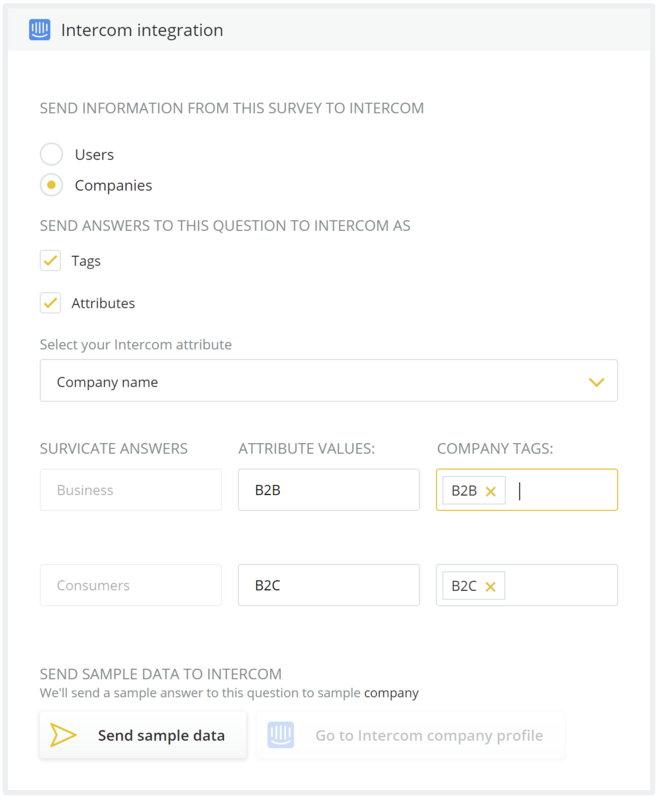 In order to avoid flooding your Intercom user profiles with data, we enable you decide on a question level whether or not to send responses to Intercom. 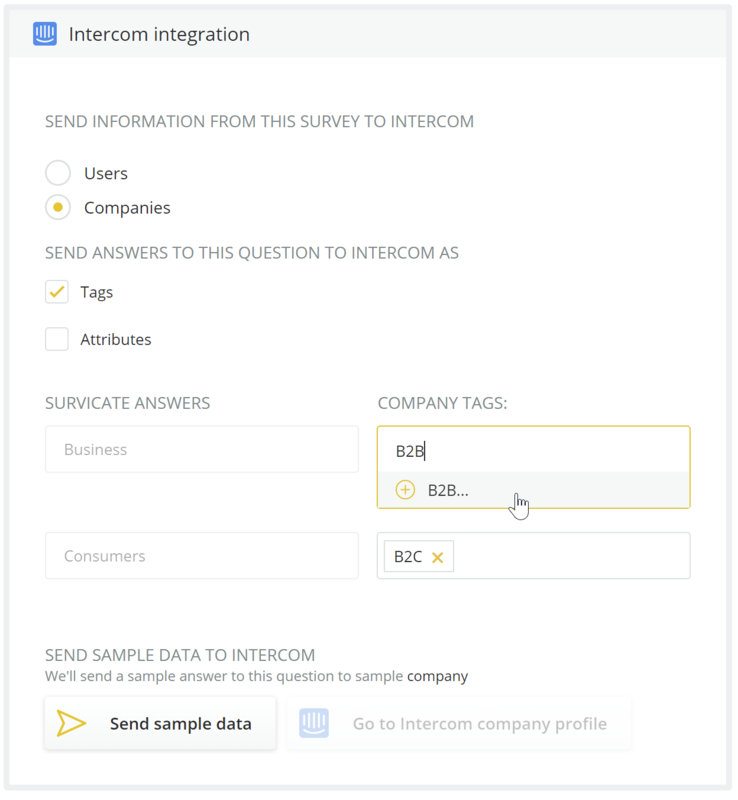 You can send responses to Intercom user or company profiles as tags and/or attributes. Survicate will also generate an event on survey responses. Attributes can be used for segmentation, targeting messages as well as personalization of your communication - you can use them in your messages. Select an attribute you want to integrate with from the list or create a new one. By default Survicate is sending answers as attribute values, but you can change the label to make it shorter or to fit your data structure - use attribute values field as below. Assign tags to each answer using tags field - you can use tags you already created or create new ones. You can assign multiple tags to your answers. Survicate is generating Intercom events on default - they will be visible in user profile activity section. We're sending survey name, question and answer in event details. You can turn off event tracking in Intercom - more on that here. When asking a text (open answer) question you may choose to have an Intercom conversation opened, to quickly act upon users' feedback, ask follow up question and drill down on insights. 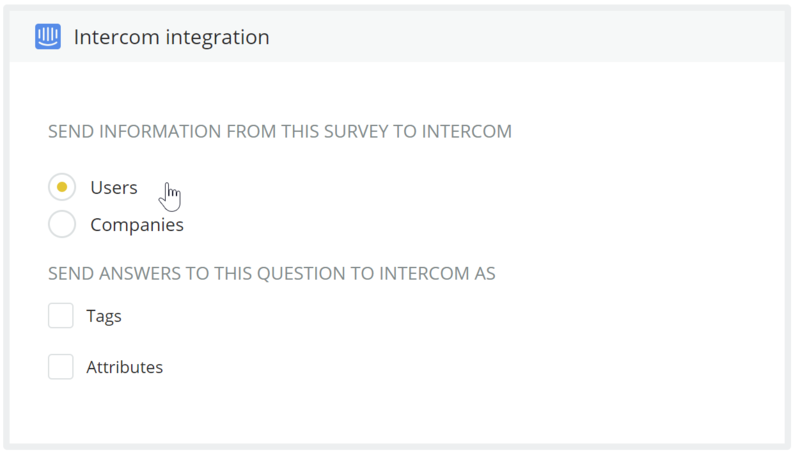 Once you have your survey ready and integration set up, you can test it without leaving Survicate - simply click Send sample data and we will create a test user and send question answers in the format you selected. You can view it by clicking Go to Intercom user / company profile. If you have any questions about the set-up, best practices and use-cases, please feel free to reach out to us via our Intercom. We could also arrange a quick demo to help you get things going.